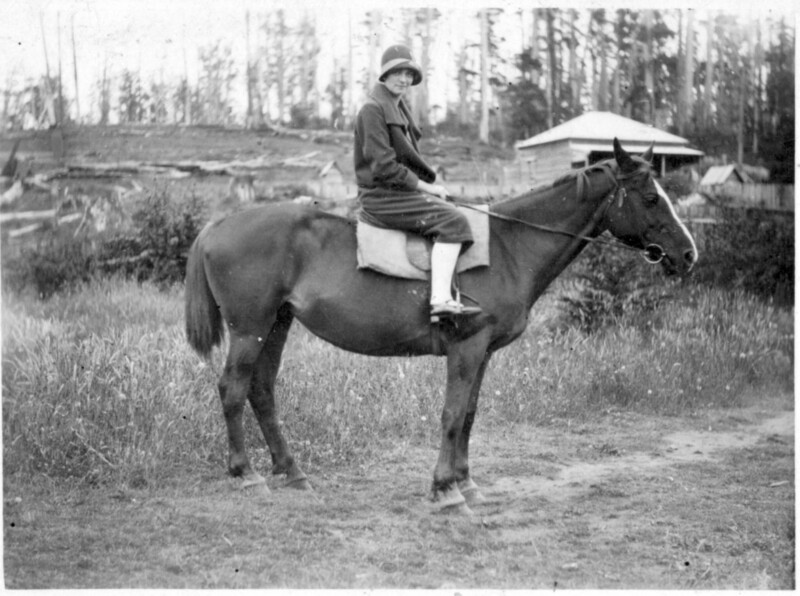 In May 1914 Ron Smith’s former Forth mate Ted Adams invited him to go hiking at Lake St Clair. Smith, who would be one of the major figures in the establishment of the Cradle Mountain-Lake St Clair National Park, could not make the appointed time. He had business to attend to at Cradle Valley, but perhaps when that was done a cross-country short-cut would bring them together. ‘I thought … I could go overland to Lake St Clair to meet you there’, he told Adams. It was perhaps in that instant that Ron Smith conceived the idea of the Overland Track between Cradle Valley and Lake St Clair. Ironically, it would take him another 27 years to walk it. The opportunity finally came in late December 1940. Now fifty-nine years old and an invalid pensioner as the result of World War I service, Smith was also the secretary of the Cradle Mountain Reserve Board, a land owner at Cradle Mountain and the major documenter of the area’s European history, flora and fauna. 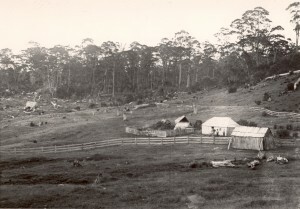 The Overland Track, the southern section of which was roughly marked by Bert Nichols in 1931, had only become suitable for independent travellers in 1935–36 after additional track and hut work by Nichols, Lionel Connell and his sons. Few people had then taken up the challenge of tramping a track that now attracts about 10,000 per year from all over the world. Ron’s early trips from his home at Forth to Cradle Mountain were accomplished on bicycle and on foot, with stopovers at Middlesex Station, but in 1940 he was able to drive from his new home at Launceston to Waldheim Chalet, Cradle Valley, in less than five hours. From 1925 to 1936 the Smiths had had their own house at Cradle Valley, and they would have one again, Mount Kate house, from 1947. 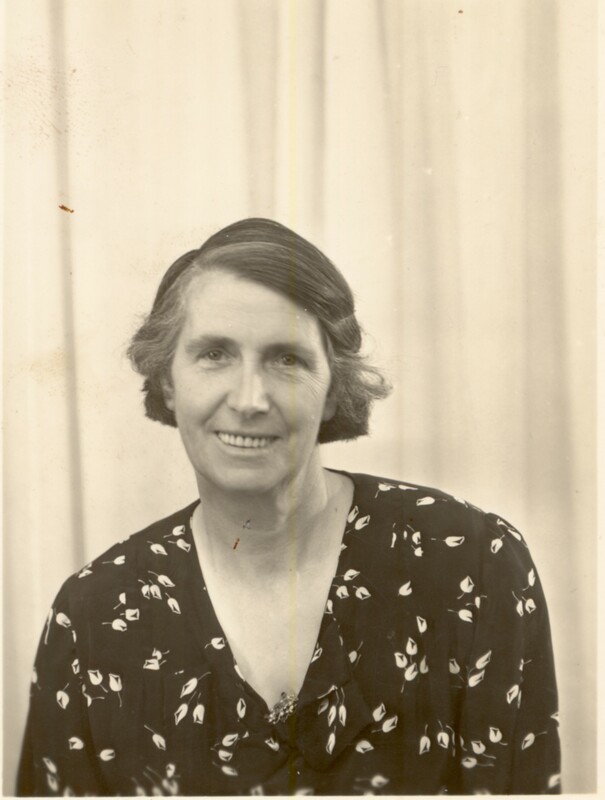 However, in 1940 they were content to stay in the late Gustav Weindorfer’s Waldheim Chalet, then managed by Lionel and Maggie Connell. In fact it was almost a second home for the Smith family, since Ron’s oldest son, whom he called Ronny, and Kitty Connell, daughter of Lionel and Maggie, were courting. And yet, despite the stringencies imposed by the war raging in in Europe, people continued to enjoy the major holiday period of the year. On Christmas Day 1940 Waldheim was bursting at the seams with hikers, 50 guests in all. What a peaceful Christmas for head chef Maggie Connell! Ron slept on a sofa in the dining room, his sixteen-year-old son Charlie on the floor of the same room. Ron Smith was always a formidable record keeper, and in his diary he recorded with typical precision that he and Charlie were on their way at 7.38 next morning, each of their knapsacks weighing 40 lbs (18 kg). After regular bouts of illness, Ron possibly doubted his own endurance. Two fit young men, Wally Connell and Ronny Smith, carried those heavy packs up to Kitchen Hut, sparing the hikers the full rigours of the tough climb up the Horse Track. After breakfast, Ron and Charlie continued alone, being passed by a party of five women who had started from Waldheim after them. Kitchen Hut was then only a three-sided shelter. 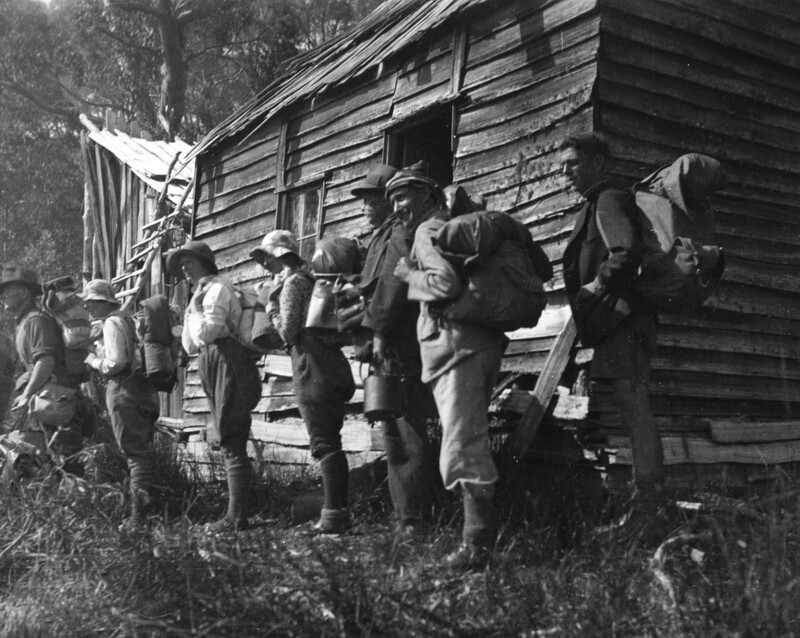 There was no proper hut between Waldheim and Lake Windermere, making day one of an Overland Track trip a long and potentially dangerous one. Ron and Charlie reached Waterfall Valley before meeting their first fellow hikers—two young Sydney men—walking in the opposite direction (from Lake St Clair to Cradle Mountain, now prohibited). The old miners’ hut at Lake Windermere, 27 December 1940. Ron Smith photo courtesy of the late Charles Smith. 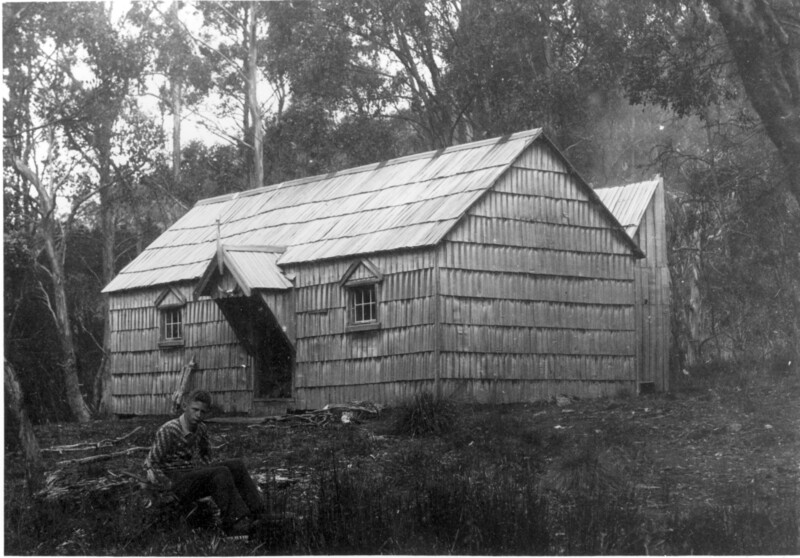 A Fred Smithies shot showing the rest of the old Windermere Hut, taken during an Overland Track tramp. Courtesy of Margaret Carrington. Father and son reached the Connells’ new Windermere Hut at 4.23 pm, nearly nine hours after setting out from Waldheim. The party of five women camped outside, leaving the hut to the men—and two grey possums, which entered, in what became Windermere tradition, via the chimney in their quest for food. 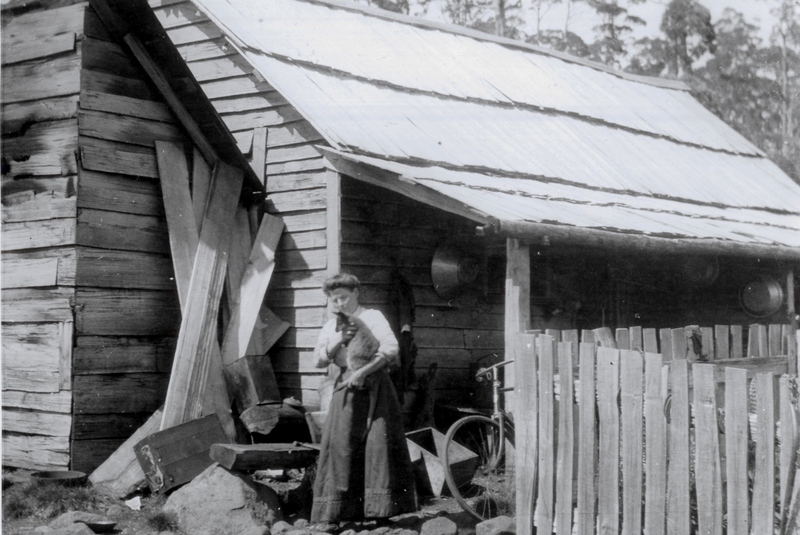 Next morning, Ron and Charlie visited the c1901 Windermere miners’ hut, now in ‘great disrepair; the chimney fallen down and the roof very leaky’. 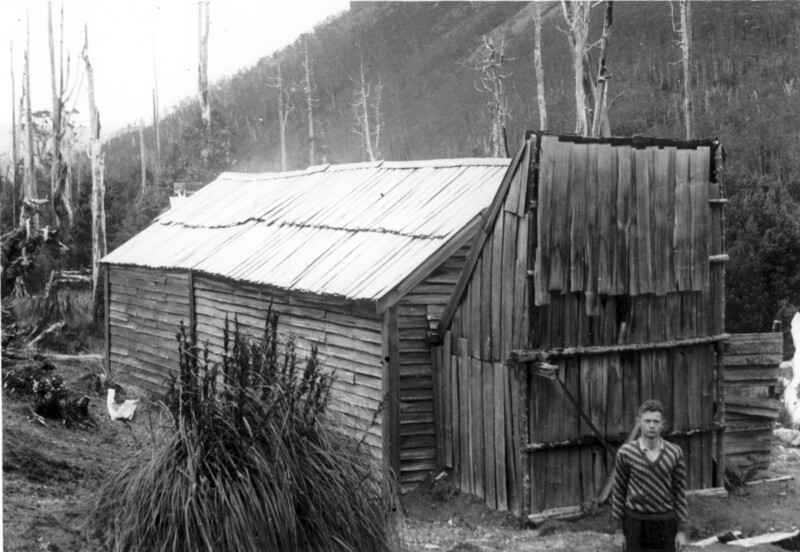 Ron had reached the old hut with Gustav Weindorfer in 1911 and 1914; it was the furthest south he had so far travelled on the route of what became the Overland Track. Day two, from Windermere along the watershed of the Forth and the Pieman, then around the Forth Gorge and through to Pelion Plain, was another tiring one. They boiled the billy for lunch on the edge of the forest at Pine Forest Moor, with the dolerite ‘organ pipes’ of Mount Pelion West looming large ahead of them. 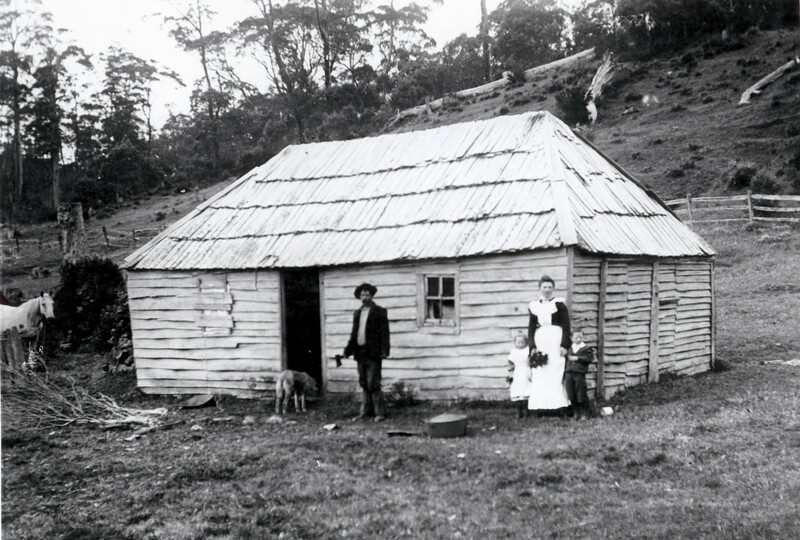 At New Pelion Hut they re-joined the party of five women, greeted a married couple called Calver who arrived from Lake St Clair, plus four Victorian men who were returning to Waldheim after climbing Mount Ossa. 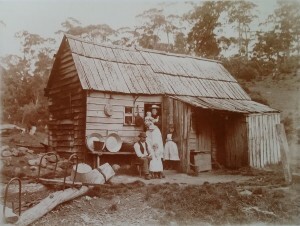 There were ten in the Connells’ new hut, which had two rooms so that men and women could be separated. For Ron every new meeting was noteworthy. Names and sometimes addresses were exchanged, and it was a chance to chat and learn. The leisurely experience was far removed from that of more recent times, when the two-way traffic could make the Overland Track feel rather like a scenic Hume Highway. 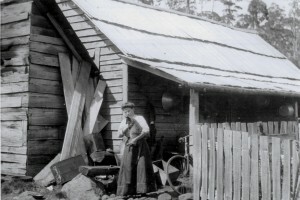 Flourishes of Federation Queen Anne and Arts and Crafts architecture in the Connells’ King Billy pine shingle New Pelion Hut, 28 December 1940, Charles Smith in the foreground. Ron Smith photo courtesy of the late Charles Smith. With rain threatening, the Smiths decided to spend a day close to shelter at Pelion. Ron had now ventured further south than his departed friend, Gustav Weindorfer, who had taken the census at the Pelion copper mine and climbed Mount Pelion West in April 1921. 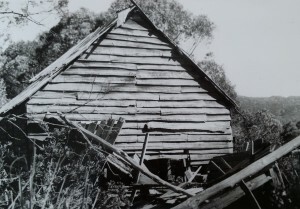 The mine manager’s hut (Old Pelion) and the workers’ hut from that period were both in good repair. Leaving these huts, Ron and Charlie crossed Douglas Creek and followed the southern edge of Lake Ayr until they met the Mole Creek (Innes) Track near the rock cairns and poles marking the then Cradle Mountain Reserve’s eastern boundary. Tommy McCoy’s hunting hut near Lake Ayr. Photo courtesy of the McCoy family. McCoy’s hut as it looked in 1951, with Mount Oakleigh and Lake Ayr for a backdrop. Photo courtesy of the McCoy family. The reserve had been a bird and animal sanctuary since 1927. Yet, cheekily poised about 250 metres beyond the boundary, Tommy McCoy’s new hardwood paling hunting hut made his intentions clear. 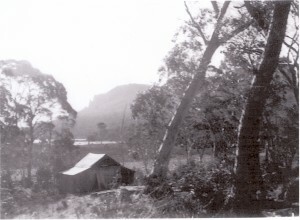 Hobart hikers would become conservation activists, puncturing McCoy’s food tins with a geological pick, when they came across his hut in 1948. 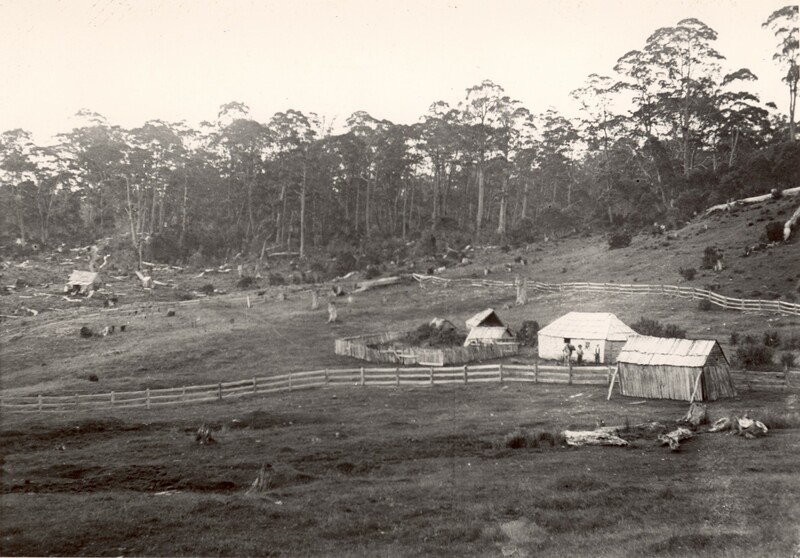 However, the Cradle Mountain Reserve Board secretary, a former possum shooter and a man of a different ilk, was much more respectful, leaving payment of threepence for a candle he removed from McCoy’s camp. Ron and Charlie also inspected the old post-and-rail stockyard near the western end of Lake Ayr on their way back to New Pelion. On their second night at Pelion propriety was dispensed with, as the Smiths and Calvers shared a room, leaving the other room for newcomers. 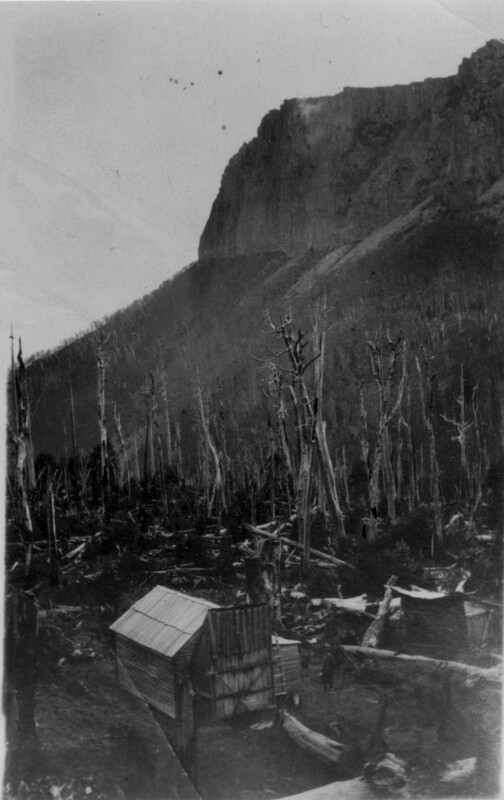 An unsympathetically cropped image of the two-room Du Cane Hut, 29 December 1940, with Cathedral Mountain omitted but Charles Smith in the foreground. Ron Smith photo courtesy of Charles Smith. An earlier Ray McClinton or Fred Smithies shot of the original one-room Du Cane, taking full advantage of the view of Cathedral Mountain. 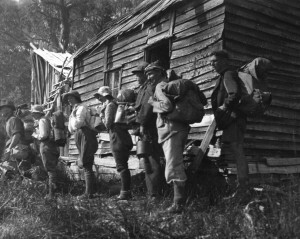 The party of five women motored past the Smiths on the climb up to Pelion Gap next day, marching right through to Narcissus Hut, a distance of about 27 km in a day. Ron and Charlie took a leisurely pace, visiting Kia Ora Falls and camping at Du Cane Hut (Windsor Castle or Cathedral Farm), Paddy Hartnett’s old haunt, which had been converted to a two-room building in keeping with New Pelion. Reflecting, perhaps, his reduced stamina, Ron elected to wait on the main track while Charlie viewed Hartnett Falls. The pair also made a diversion to Nichols Hut, the walkers’ hut Bert Nichols had erected beside his old hunting hut. 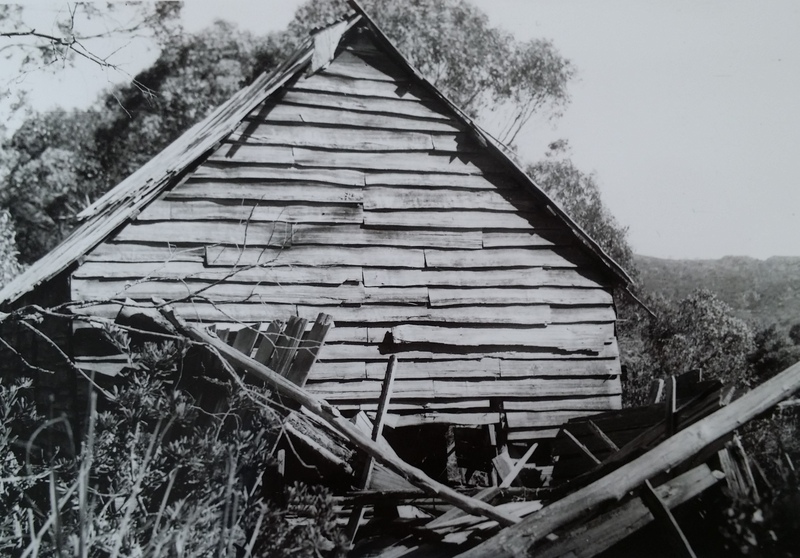 For a man who in his younger days rarely left a bush setting or bush person unsnapped, Ron Smith was relatively parsimonious with his photos on this trip, neglecting these buildings, McCoy’s hut and the old Mount Pelion Mines NL huts. 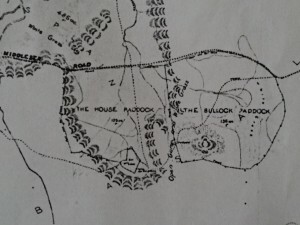 He appears to have been ignorant of the other hunters’ huts located near the track between Pelion Plain and Narcissus River. 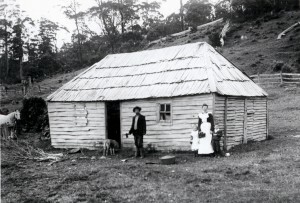 Ron and Charlie were accompanied most of the way from Pelion to Narcissus Hut by the Robinsons, a Sydney couple they had first met at Waldheim. Crossing the suspension bridge over the Narcissus River, Mrs Robinson’s hat landed in the drink and disappeared, despite a group rescue effort. 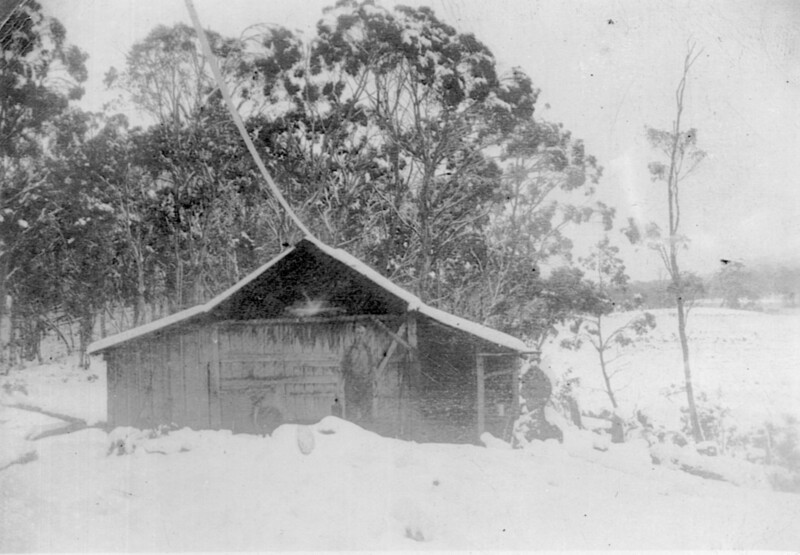 Narcissus Hut, the staging post for the motorboat trip down Lake St Clair, as it is today, replicated the situation at Waldheim, being full to the brim and beyond, with numerous tents being pitched outside. Among the hikers were the economist and statistician, Lyndhurst Giblin, and HR Hutchinson, Chairman of the National Park Board, the subsidiary of the Scenery Preservation Board which oversaw the Lake St Clair Reserve. Indeed, it must have seemed like the veritable busman’s holiday when the Cradle Mountain Reserve Board secretary met the Lake St Clair Reserve Board chairman on the Overland Track that united their realms. 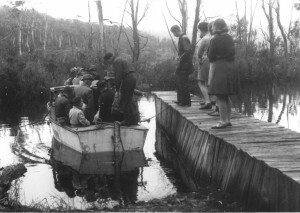 Bert Fergusson’s motorboat loading at Narcissus Landing, 31 December 1940. Seventeen to board, including the party of five women, and a tentative Charles Smith (fourth from right). Ron Smith photo courtesy of the late Charles Smith. The trip was concluded in six days. It took 1 hour 45 minutes to traverse Lake St Clair in the famous Bert ‘Fergy’ Fergusson motorboat on New Year’s Eve, 1940. This seems extraordinarily slow progress—didn’t Paddy Hartnett row the lake faster than that 30 years earlier, against the wind?— until you realise how overloaded Fergy’s vessel was! Seventeen people were crammed aboard what was certainly not Miss Velocity. Ron and Charlie slept in Hut Twelve of Fergy’s tourist camp at Cynthia Bay, where a housekeeper, Mrs Payne, was also employed. From here Fergy operated a free ‘bus’ service (Jessie Luckman called it a ‘frightful old half bus’ sporting sawn-off kitchen chairs with basket-work seats) to Derwent Bridge, where the departing tourist joined one of Grey’s buses. The Lake St Clair tourist infrastructure of 76 years ago was surprisingly well organised. 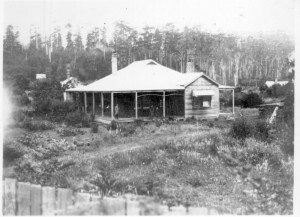 Charlie having departed with family members, Ron stayed on a day more and caught a bus back to Launceston via Rainbow Chalet at Great Lake and Deloraine, using a short stopover in that town to submit a butcher’s order for Fergy. All this recreational transport at a time when petrol was rationed for the war effort! On 3 January 1941 Ron Smith rested at home, having at last completed the journey contemplated 27 years earlier. Perhaps the experience strengthened his belief in the need for a motor road from Cradle Mountain to Lake St Clair, thereby conferring universal reserve access. Age may not have wearied him, but maybe at that moment his swollen right foot felt more comfortable on an accelerator than in a heavy boot. See ‘Ron Smith: bushwalker and national park promoter’, in Simon Cubit and Nic Haygarth, Mountain men: stories from the Tasmanian high country, Forty South Publishing, Hobart, 2015, pp.132–59. Ron Smith to GES Adams, 15 May 1914, NS234/17/1/4 (TAHO). See Simon Cubit and Nic Haygarth, Mountain men, pp.122–27. See ‘Smith huts’, in Simon Cubit and Nic Haygarth, Historic Tasmanian mountain huts: through the photographer’s lens, Forty South Publishing, Hobart, 2014, pp.36–43. For the 1911 trip, see Ron Smith to Kathie Carruthers, 29 November and 1 December 1911, NS234/22/1/1 (TAHO). The pair’s arrival at the Windermere Hut in 1914 had scared the life out of its incumbent, miner/hunter Mick Rose, who feared he had been he had been nabbed engaging in out-of-season snaring. Gustav Weindorfer diary, NS234/27/1/8 (TAHO); ‘Mountain beauties: Tasmania’s charms’, Examiner, 6 January 1934, p.11. See, for example, minutes of the Cradle Mountain Reserve Board meeting, 25 June 1947, AA595/1/2 (TAHO). This account of Ron and Charlie Smith’s walk on the Overland Track is derived from Ron Smith’s diary, NS234/16/1/41 (TAHO). 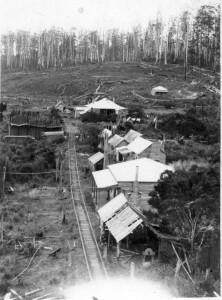 The seven-roomed 1922 bungalow ‘Glen Valley’, with the steam sawmill in the background at left, and the loco shed to the right. ‘Glen Valley’ with lattice added to the veranda and the garden further developed. HOUSE-WARMING. — Mr E Britton has built a spacious residence at Christmas Hills. On Easter Saturday night the residents wended their way to give Mr and Mrs Britton a house-warming. A very pleasant evening was spent and cheers were given for Mr and Mrs Britton. During the evening items were rendered by Mrs P Streets, Miss E Dunn, and Messrs S Rowe, O Murphy, T Hine, A Rowe, R Dunn, and E Rowe. Excellent music for the dancing was supplied by Mr Y Wilson. Mr P Streets very capably carried out the duties of MC. View from the chimney of the original sawmill, showing the blacksmith’s shop (foreground), workers’ cottages (middle distance) and the Britton family house (background). 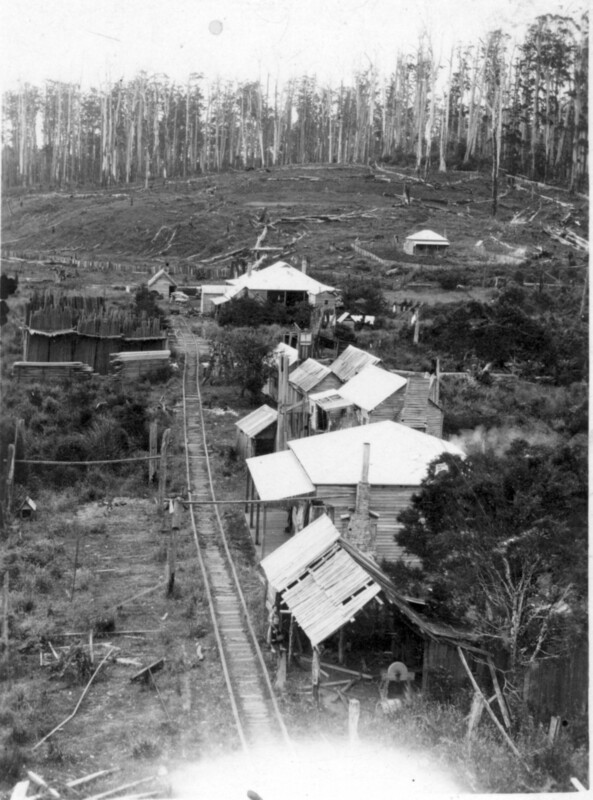 The tramway pictured was used to supply wood to the house. The Bass Highway would later separate ‘Manuka’ from the other buildings. This was long before electricity or sewerage came to the bush. The toilet was a kerosene tin in a little hut behind the house. Once or twice a week the kerosene tin was emptied, the effluent being buried in a hole. The mill workers’ cottage vacated by Elijah’s family became Mark Britton’s quarters, where he slept and did the office work. Once a year Lorna washed his blankets and scrubbed his dirty floors. Mark was in the habit of piling bark, sticks and firewood against the inside wall of his office. ‘This was clean dirt, so I’d take that out and scrub that room, but the bedroom was the worst’. ‘Our home was his real home’, Lorna remembered. ‘He had his special place at the table and sat one side of the fireside of an evening in the lounge chair opposite Father all the years he lived with us’. Lorna Britton leaving for a painting lesson on the ‘scary’ light chestnut draughthorse Boxer. She wrote that this horse was ‘so skittish he could toss me off his back easily, but boy could he trot. On the way to Smithton with the drains on each side of the Mowbray Swamp, it was a nightmare to have this scary horse. A passing car could make him jump sideways and you’d end up in the huge drain’. In the background is the cottage behind ‘Manuka’ which was used by workers at the mill, and in which Philip and Maria Britton also stayed. An unusual shot of a middle-aged Annie Britton smiling. Mother was either too sick or too busy to give the children much love, and I lavished all my affection on those kids. I never knew Mother to be affectionate to me or Phil, and we missed out there. I was amazed to hear someone say they didn’t know I did anything other than play the violin and piano, paint, and be a lady. Maybe I did when they knew me, but who did the helping where there was no hot water and electric power and light? I would do the last tea dishes in a dish of hot water on the kitchen table by the light of one candle, and put away the meat that came late. It had to be lightly salted and put in the meat safe in a cool place. Mother would already be in bed, and I’d still be working till 8 or 9 o’clock. He loved the farm animals and could find a calf that had strayed or been hidden by its mother, or a hen’s nest. At that time the common swear word was ‘cussed’, heavily emphasised. I never heard my father, uncle or brothers swear, so Ken came running in at the lisping stage, clutching an egg and shouting ‘I heard a dusserd hen dackle, and I runned over and bruted her off the nest’. It was a favourite saying around the mill for a long time and caused many a happy moment. Ken Britton at six months of age in 1921. But he survived, and I cared for him until I was sent away to school in Launceston for one year. When I left school he was still weak and sickly, suffering many colds and Mother and I sat up more nights than I wish to remember when he had croup and we tried with limited medical care to ease his suffering. One night he was so distressed that Mother, with her face set in anguish, left the room and brought in a spoonful of something which she poured down his little throat and soon brought relief. What it was I never really knew, but it was probably something that her mother had given her as a child. I think the mixture contained turpentine. Both feared he would not ‘make old bones’, but John would prove them wrong. Unfortunately, to do so, he would have to survive an accident in which his legs were crushed. 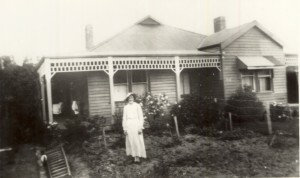 Lorna Britton at Broadland House, Launceston, 1923. ‘Christmas Hills’, Circular Head Chronicle, 26 April 1922, p.3. Frank Britton memoir, 16 December 1992 (QVMAG). ‘Xmas Hills Picnic Sports’, Advocate, 21 March 1923, p.6. 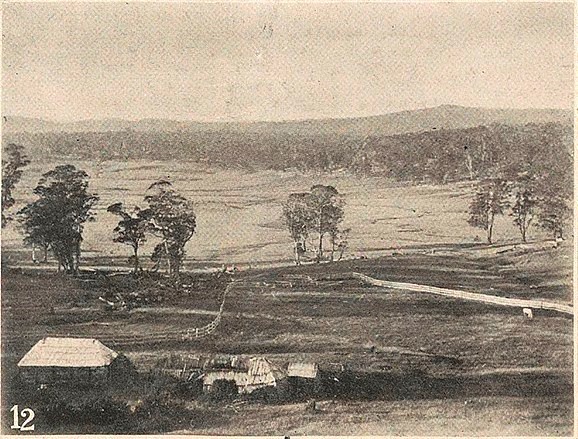 ‘Christmas Hills: farewell’, Circular Head Chronicle, 14 February 1923, p.2.